All Levels. Explores the fundamentals of playing the popular chord changes jazzers refer to as "Rhythm Changes." For decades, jazz greats have used this chord progression as a springboard to new interpretations and improvisations. Charlie Parker practiced "I Got Rhythm" in all 12 keys and recorded tunes based on its harmony on at least 28 separate occasions! Includes written melody and solo sections. Special sections contain uniquely designed slow recorded tracks to help you fully understand the harmonies. 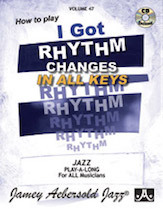 Includes step-by-step instructions and examples of common "rhythm" techniques and practice, including the use of blues, diminished, pentatonic, and other scales, and playing the "changes." This set has everything you need to get a true performance-quality understanding of "I Got Rhythm" changes!